To celebrate World Book Day 2019, we all dressed up as one of our favourite book characters! Also, we were visited by children's author Faye Evans, who read her new story 'Bob's Beard'. The children had the chance to act out the story with puppets, learn the actions and also ask Faye questions about being a real-life author! We were lucky enough to receive some wheelchair rugby training from a coach from Sale Sharks! It was an opportunity for the children to learn all about the challenges of using a wheelchair and to experience how sport can be made accessible for all. In Year 2, we have learnt all about democracy! We chose 3 potential destinations for our end of year school trip, then elected candidates to campaign at break times and lunchtimes! We then held a vote, complete with Polling Station and ballot box, to decide our final choice. We have also been busy designing, making and evaluating some clay models to celebrate Valentines Day. The children used lots of different tools and techniques to finish their special gift. Today we had a visit from a mobile planetarium. We crept inside and watched in wonder as the planets and stars rolled around inside, We learned lots of interesting facts. We have had a wonderful first term and the children have settled in really well. They have all become bookworms - Roald Dahl stories are so hard to put down! The children wrote their own Roald Dahl stories in special booklets. We will try to get through a few more of his books as the year goes on. We had a wonderful Spooky Day on the last day of term. The children all looked very scary (well, cute scary). Last Friday, November 9th, we had a special assembly to commemorate 100 years since the end of the Great War. The children wore poppies and each year group made their own poppies. After the assembly we took our poppies outside and planted them before holding 2 minutes silence. The children were wonderful. The children looked great in their spotty accessories and we raised money for a good cause too! We had a wonderful time performing our show for parents and grandparents. Party day was great. The children looked very festive and really enjoyed the entertainment and party food. We also took a trip to the Waterside Theatre to watch Father Christmas. It has been a very special time. The first half term ended with Spooky Day which was great fun. The children looked really scary, (well, cute scary). We started Autumn 2 with a look at the Victorians. We wrote diary entries and compared life then and now. In December the classroom transformed into a Victorian school room and the children spent the morning doing Reading, Writing and Arithmetic. After lunch they made Victorian crackers and listened to the story of the Nutcracker. The children performed superbly in our Christmas production. They sang and danced their way through many performances to amaze parents and grandparents alike. This term we are looking at Space which is always a favourite with the children. They always know so much about the planets and are so enthusiastic. 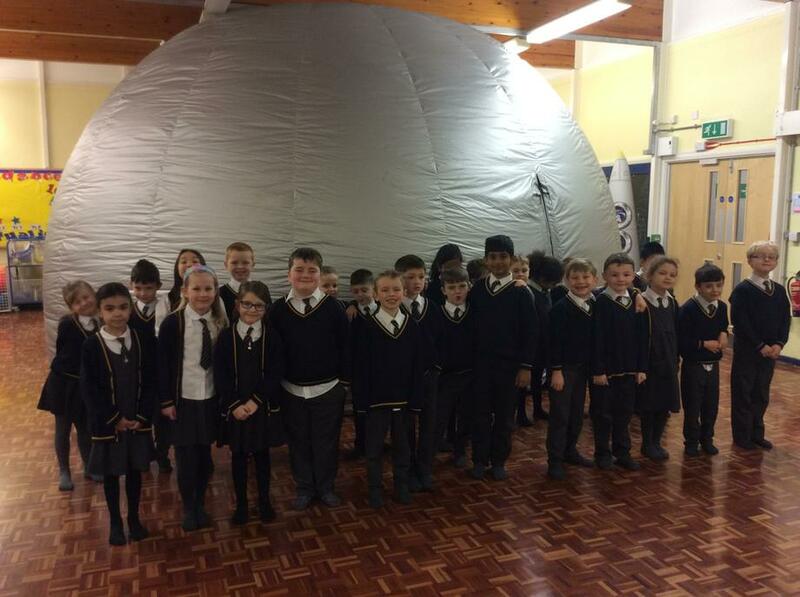 We have a mobile planetarium visiting us to enrich our learning. Spring 2 saw the arrival of the snow (of course). We made the most of it and had a snow day with snowmen and snowwomen. World Book Day was a real treat, the children all looked wonderful and we spent the day enjoying books. We even popped over the juniors for them to read us a few stories. We had lots of fantastic entries and it was so difficult to choose. Everyone was a winner really so everyone got a little chocolate treat. We eventually decided on Millie's Solar System and Joshua's Star Wars. The whole school took part in an obstacle course to raise money for Sport Relief and Mukti who is a little girl we sponsor in Nepal. We chose candidates for the 3 parties. The parties were the Zoo Party, the Farm Party and the Aquarium Party. The children canvased for votes at playtime and lunchtime and gave out stickers to voters. On Thursday afternoon they headed off to the Polling Station to put a cross on the ballot paper. They put them into the sealed ballot box. Judith, our Intergen Officer counted the votes and delivered the official results. The Zoo won with a majority. We can’t wait to go!